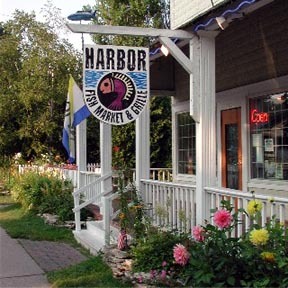 Harbor Fish Market & Grille on the shores of Lake Michigan in Baileys Harbor serves breakfast, lunch and dinner seven days a week. Outdoor dining is available in the spring and summer on the garden patio. The Garden Patio is pet-friendly and even boasts it’s own Doggy-Menu for our four legged friends. Lobster Omelet- The decadent treat you can’t resist – Maine lobster with light cream cheese, sour cream and fresh spinach and preserves $14. Catch of the day- Please check with your server for today’s selection. All entrees include Idaho baked potato & fresh house vegetables included, unless other starch is indicated. A 1.5-2# live Maine lobster, baby red potatoes, corn on the cob, New Zealand mussels and steamed clams – plus Maine Lobster Bisque and Door County Cherry Bread Pudding! Reservations encouraged – speak with your server or call for details! Served every Wednesday, Friday, Saturday & Sunday evening – all year long! Your server will describe today’s homemade choices. We gladly accept Visa, Master Card, Discover & American Express. An 18% gratuity may be added to tables of eight (8) persons or more. (We are unable to provide separate guest checks.) Serving breakfast from 7:30 am; lunch and dinner served daily. Open 7 days a week all year. Reservations encouraged. Outside dining in season. All menu items available for take out.